The first sequence’s elements is what sample emits, while the second sequence’s elements determine when sample emits. So in a way yes - the actual values A, B, C, D do get totally ignored. 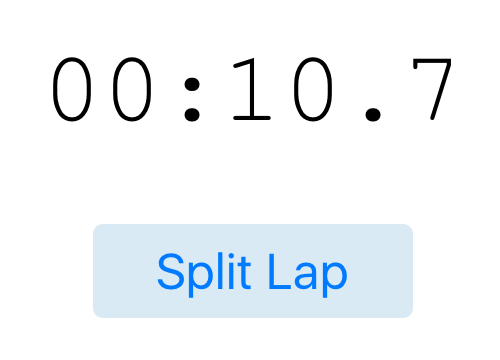 This brought me to creating a split lap timer app to test what sample can do for me. In the finished project I have a timer emitting time values (aka the first sequence) and I want to grab (or sample) the values whenever the user taps a button (aka the second sequence). 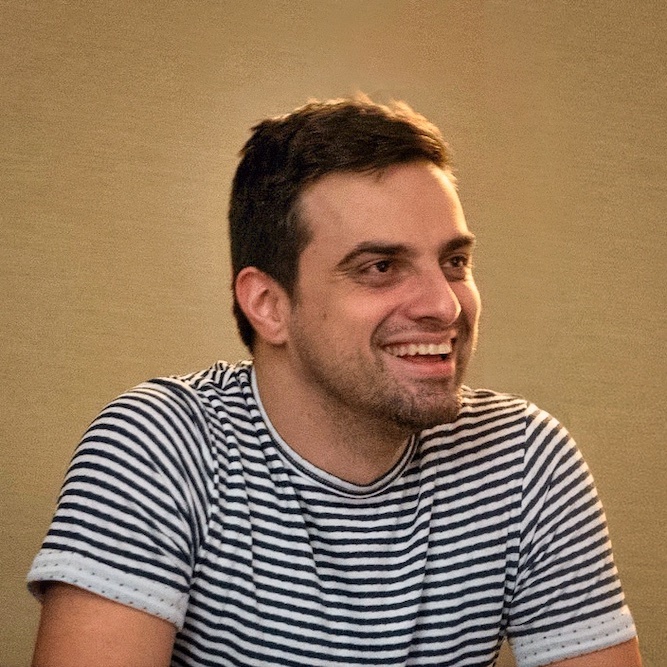 Functional code is awesome because I get 2 huge wins for free: I can easily reuse stringFromTimeInterval and I can write very simple tests for it. Ok here I was supposed to have my ultimate win by using sample. The first few tries didn’t get me far until I realized that the rx_tap property on UIButton is also an Observable. Then it was just a matter of calling sample on my timer and providing as a control sequence the rx_tap property of the button like so: timer.sample(btnLap.rx_tap) Whaaaat? Now each time I tapped the button sample emitted the latest value produced by timer. And since I wasn’t interested in the number but in the formatted string I again mapped the result with stringFromTimeInterval. So - each time sample emits a new lap time scan emits an array of all the split times so far. And my app was already working! 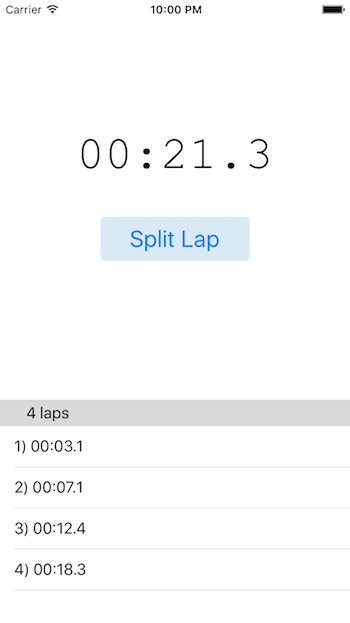 Each time I tap the “Split Lap” button I get a new split time added in the table view. Sweet! This part was the one that tripped me the most. There wasn’t a binding I could use for the table header and I didn’t want to complicate the code unneccessarily by adding a section table data source. What came to mind was to add a UILabel property to my view controller and use it as the table header view. 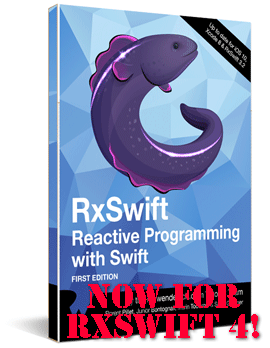 Then bind the count of split times to the rx_text of that label. And now came the coup d’etat - I had to map lapsSequence from an array to a single string (e.g. 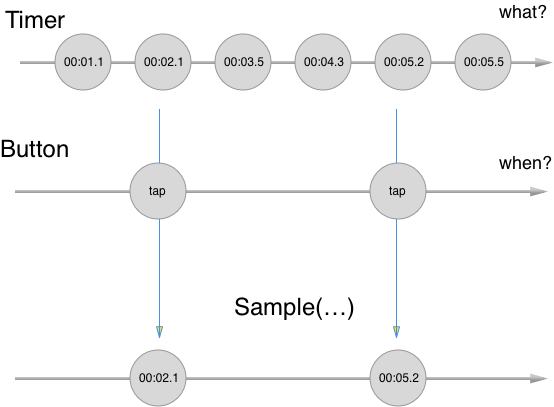 “5 laps”) and bind that string to the table header. I got overexcited about using scan but the code did feel itchy so after asking around on the RxSwift slack KrunoslavZaher enlightened me that since I have one array I can turn it into one string by simply using map. Since lapsSequence emits an array of all split times each time a new split time is emitted I just take that array and return a string with the number of elements. Additionally I set the initial value to “no laps” and that’s pretty much it - I bind everything directly to tableHeaderView.rx_text. And that’s the complete working app! You can download the completed project and give it a try here: rx_laptimer.zip.